Did you know that Florida has its own Arbor Day, celebrated on the third Friday of January? While the nationwide celebration occurs in late April, many states observe their own Arbor Day at the start of their tree-planting season. In honor of Florida Arbor Day, Michael Andreu, associate professor in the UF/IFAS School of Forest Resources and Conservation (SFRC), will be speaking at the Cotton Club Museum and Cultural Center, on Friday, January 18 at 11:45 AM. Andreu, who joined the SFRC faculty in 2005, specializes in urban forestry. 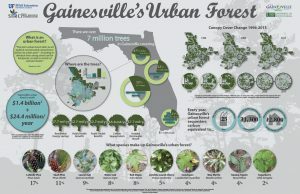 In 2016 he led a research team in partnership with the City of Gainesville and the University of South Florida to perform an urban forest ecological analysis in Gainesville. During spring to early fall of 2016, the team sampled and analyzed 177 plots to quantify the vegetation structure, functions, and values of our urban forest. Gainesville has an estimated 7.2 million trees, comprised of 97 species. Using i-Tree, Andreu’s team identified $1.4 billion in compensatory value derived from Gainesville’s trees. While the ecosystem services provided by trees are crucial, there is a human connection with forests as well. As Andreu was recently quoted in an article in the Gainesville Sun: “People talk about trees, are interested in trees, love trees. It can be very emotional. Spiritual, even.” Trees provide natural beauty and wildlife habitat, and can even serve as gathering spots, landmarks, or nature’s jungle gyms. Happy Florida Arbor Day to SFRC’s future foresters!